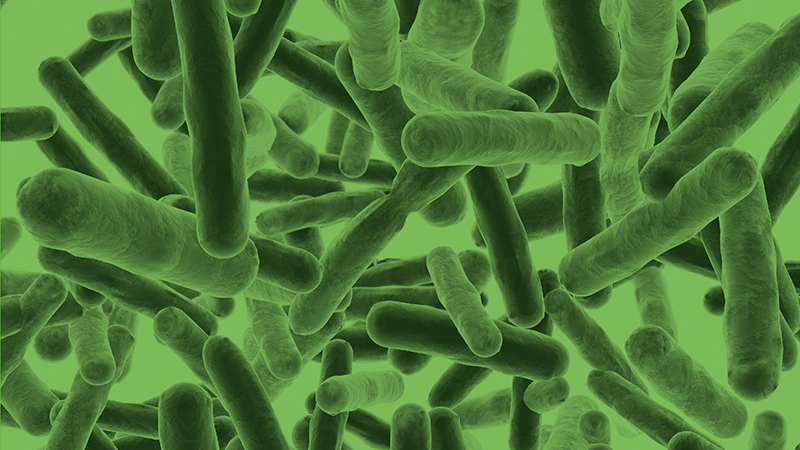 Pseudomonas aeruginosa is a serious bacterial threat in healthcare settings and it is commonly found at the ends of pipe systems and outlets where it can form a biofilm. Transmission occurs when a patient or healthcare worker touches a contaminated tap or sink. Infection with the bacteria can lead to serious health problems, especially among immunocompromised patients such as the elderly and premature infants, cancer patients or people in burns units. A Gram-negative bacterium, P. aeruginosa is both difficult to prevent and eradicate. The UK Department of Health guidance on testing for P. aeruginosa was brought in after the bacteria was identified as the pathogen responsible for a serious disease outbreak in Northern Ireland in 2012. The guidelines, “Health Technical Memorandum 04-01 (HTM 04-01) Addendum: Pseudomonas aeruginosa”, advice for care units suggests that routine sampling and testing should be undertaken only in those areas of the hospital that have been designated as providing augmented care. Here, every outlet should be tested at a minimum frequency of every six months. It is left to individual hospitals’ water safety groups to commission risk assessments to see whether more frequent testing is necessary. By monitoring the condition of water systems and instigating rapid remedial works, facilities managers can ensure that contamination does not lead to prolonged closure of wards which reduces the efficiency and capabilities of a hospital. The biggest frustration for facilities managers wishing to undertake routine monitoring of water systems for P. aeruginosa is the cycle time between sampling and results, as activities must be carried out precisely in line with the HTM 04-01 guidelines to ensure their validity. 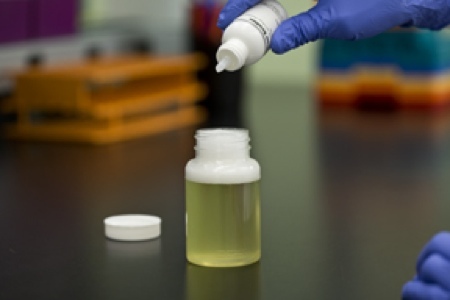 Microbiology sampling and testing are usually carried out by third-party contractors. 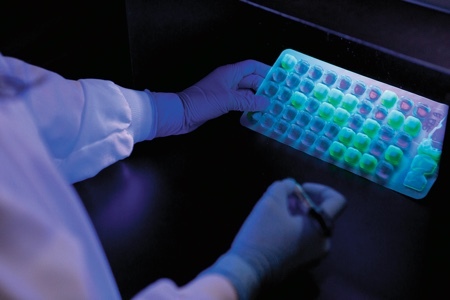 For P. aeruginosa, samples should be processed at the laboratory within two hours of taking them, but where this is not possible, the samples must be refrigerated within two hours, kept cool and processed within 24 hours. Typically, confirmed quantitative results for P. aeruginosa can take anywhere from 48 to 72 hours, and in response to a positive identification of contamination, an outlet needs to be isolated and taken out of action to allow remedial work to be expedited. Assurance that this action is effective can take several cycles of testing before being deemed successful and the outlet can be shown to be clear of the pathogen. This 2-3 days cycle time can lead to areas being unable to function for a prolonged period, and the reliance on external contractors to respond to sampling and testing requests can increase this further. The problems caused by these delays have led to a number of UK hospitals looking for alternative methods of sample processing and testing, and establishing in-house water safety teams that allow facility managers to take greater control of testing and remove reliance on third-party contractors. Having these in-house capabilities can reduce the time facilities may have to be out of commission. 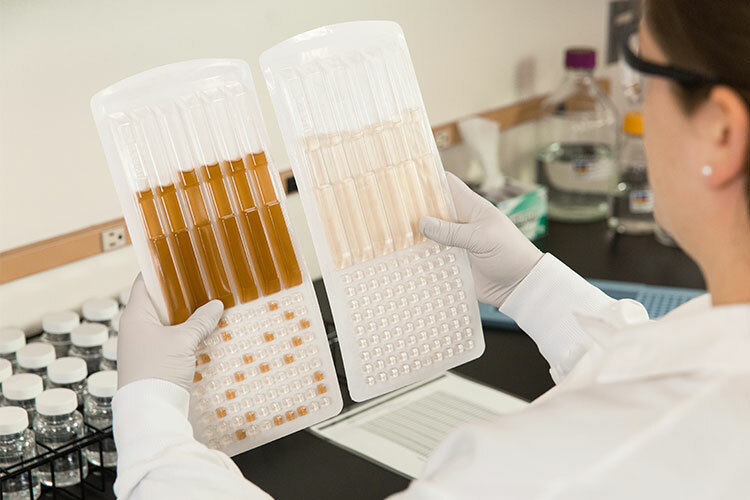 New standard for rapid identification Unlike traditional culture methods to detect the presence of P. aeruginosa, Pseudalert, which was launched by IDEXX Water in 2014, uses a unique bacterial enzyme detection technology to provide confirmed results in 24 hours. In the UK, the Pseudalert has been accepted by the UK Standing Committee of Analysts for the analysis of drinking water, and is specified as a recommended method in the Committee’s “Blue Book” publication, “The Microbiology of Drinking Water (MoDW) Part 8 – Methods for the isolation and enumeration of Aeromonas and Pseudomonas aeruginosa.” This recognition means that IDEXX's technology meets the requirements specified by the Department of Health publication HTM04-01 and is therefore validated to be used to undertake the microbial examination of water samples for P. aeruginosa in a UK healthcare environment. In September 2018, Pseudalert became accepted as the global ISO standard, published as ISO 16266-2:2018 “Water Quality – Detection and Enumeration of Pseudomonas aeruginosa –Part 2: Most Probable Number Method”. Pseudalert is also included in several European country-specific standards and was shown to be as accurate as or more accurate than the traditional method in two independent studies. The test itself consists of a powder, which is added to a standard 100 ml water sample, and then incubated at 38°C for 24 hours to determine the presence or absence of the pathogen. 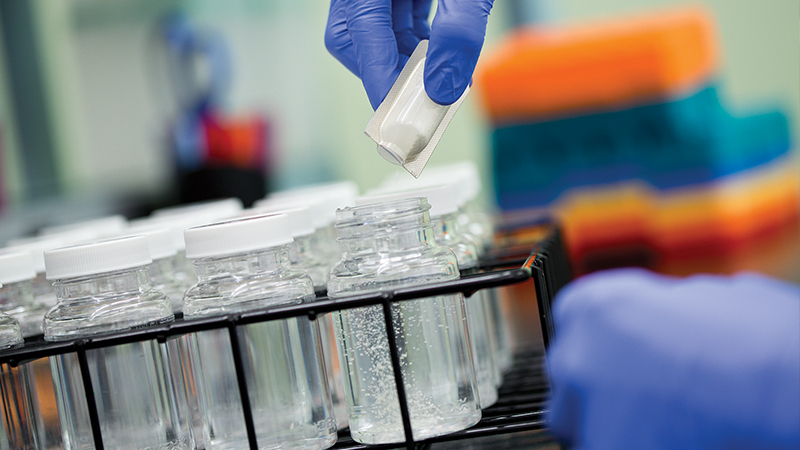 Unlike traditional techniques, no media preparation is necessary and the non-toxic reagents come in ready-to-use, unit-dosed packaging. Pseudalert detects P. aeruginosa at levels as low as one colony-forming unit, in a 100 ml sample, within 24 hours. Quantification of bacterial contamination is undertaken using the IDEXX Quanti-Tray, which is a specifically designed, multi-well plate to enumerate bacteria in water samples. 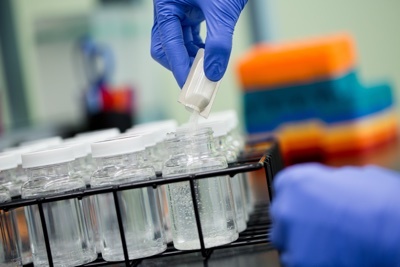 Once the water sample is collected, the pre-dosed powder is added to the sample container, then agitated and poured into the Quanti-Tray, which is sealed, to create a number of discrete cells where the reaction takes place when incubated. 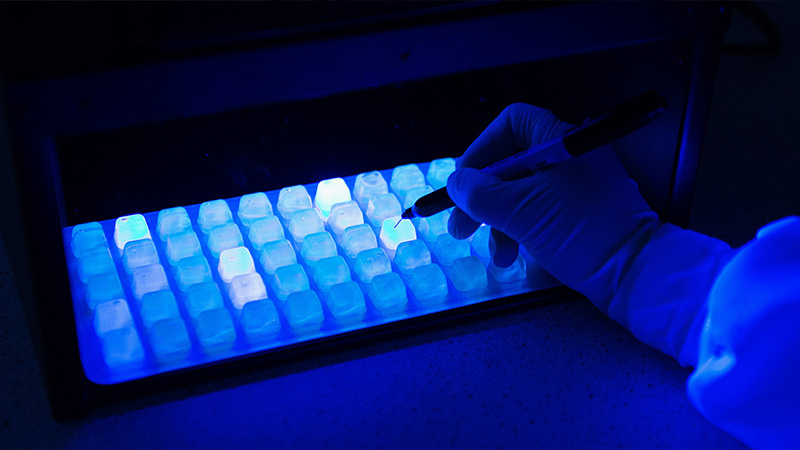 After 24 hours of incubation, the number of wells that fluoresce under UV light is counted, and this is used to determine the level of contamination using the most probable number (MPN) method. This is illustrated in the main picture on p53. In addition to being a rapid test, Pseudalert reduces ambiguity caused by false positives. Atypical strains shown up by traditional methods that need positive identification can add up to six days of additional analysis, which leads to facilities being temporarily unusable for extended periods and a delay of any essential remedial work. Unlike traditional culture methods used for microbiology testing, Pseudalert tests can be carried out onsite at a hospital by trained staff. The set up necessary for this requires very little space and equipment, and a user can process a sample in less than a minute. The interpretation of results is as simple as observing a colour change. Carrying out the test onsite reduces the time spent transporting samples and allows for more frequent routine detection and trend analysis. By empowering facility managers to take control of sampling, analysis and detection – and having the assurance and confidence in the results – Pseudalert can potentially save lives among some of the most seriously ill and vulnerable populations in hospitals. IDEXX provides a complete system to enable the detection of P. aeruginosa that is simple, reliable, accurate and cost-effective. For facilities managers, the system offers rapid testing and results that can be used confidently to determine either presence/absence or a quantified result simply using a Quanti-Tray. The IDEXX On-Site Water Testing System equipment includes an IDEXX Sealer PLUS and Quanti-Trays, Pseudalert reagent, vessel rack and sample bottles, an IDEXX UV light with viewing box and an incubator. Many hospitals in the UK are now benefiting from using Pseudalert to monitor their water systems, including King’s College Hospital NHS Foundation Trust and Oxford University Hospitals NHS Foundation Trust. The widespread nature of many waterborne pathogens means it is never going to be practical to remove them from the water supply before it enters a hospital; but by the integration of good practice, efficient cleaning procedures and effective testing protocols, hospital-acquired infections from water sources can be prevented and controlled. In 2017, after a decade of research and development, IDEXX launched the Legiolert, a method to accurately detect the presence of Legionella pneumophila in potable and non-potable water samples. 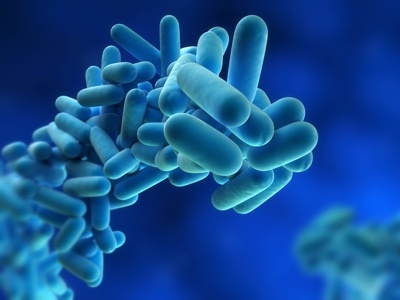 L. pneumophila is the principal causative agent of Legionnaires’ disease, and Legiolert gives accurate results in just seven days, allowing rapid detection and remediation. Like Pseudalert, Legiolert can be used effectively for onsite testing. N.B. This article is featured in the January 2019 issue of Cleanroom Technology. The digital edition is available now.